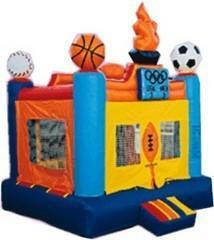 Sports Arena (Olympic) 15 x 15 jump house sports themed bouncy Buy It today! Olympic Sports Arena Retired Buy it Today! Baseball, Basketball, Soccer, Football! Favorite sports rental for your team! Referees come ready to set-up the International Sports Arena moon bounce rental to keep all of your young athletes safe bouncing, jumping, and moonwalking. 15 feet long, by 15 feet wide, by 15 feet tall. The International Sports Arena jump house rental will be delivered to your home or party/event location and be set up for you. Last Permitted in 2016 Large size and in good operating order. Manuals, directions and safety training including in price.